Fabrice TONNELLIER sent us in preview his new album Best Of Un Temps Pour Soi – Best Of which will available for sale from October 1, 2014. 14 tracks including a previously unreleased, 72 minutes. 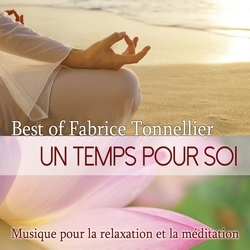 Since the release of his first album "L'Instant Présent" in 2005, the relaxation music of Fabrice Tonnellier are appreciated by a wide audience. Born in 1978, pianist and arranger, Fabrice Tonnellier is inspired by the practice of Zen, nature, energy arts and world music. His music promotes healing and inner peace. We are pleased to make you discover it from September 6, 2014 on Radio PLENITUDE, every day until 19 September, before it enters in a regular programming.